Like everyone, after graduation, I tried to find a job. The good days when I was a student that parents were supportive (in the financial way) are over. In this search, that is still going on, I was overwhelmed by diversity of employers, they offer, terms, and conditions. Here are some of the impression on this topic, mine and some friends of mine, too. Yes, probably is a game of words all that I said just now, but for me was something real! I don’t say that I don’t have any experience, cause I do have, but it’s just that according to some of the employers that interviewed me, is not the right one or not long enough. Yeah, sure! I have been student for three years, so if I could have found a profile-job at the time that I was only a freshman, (that’s even more impossible than it is now ), at the time of the graduation, I would have the right experience. So, according to these little theories of mine: Finding a good job- it’s not going to happen in the near future! Other employers, that realize that to hire someone that has good knowledge and experience in the specific field, is more unlikely, So they have a different solution for that. But even here, not all understand that solution in the right way. Most of the big companies, before hiring an employee, they make them pass two or three stages. First one, it’s the CV application. 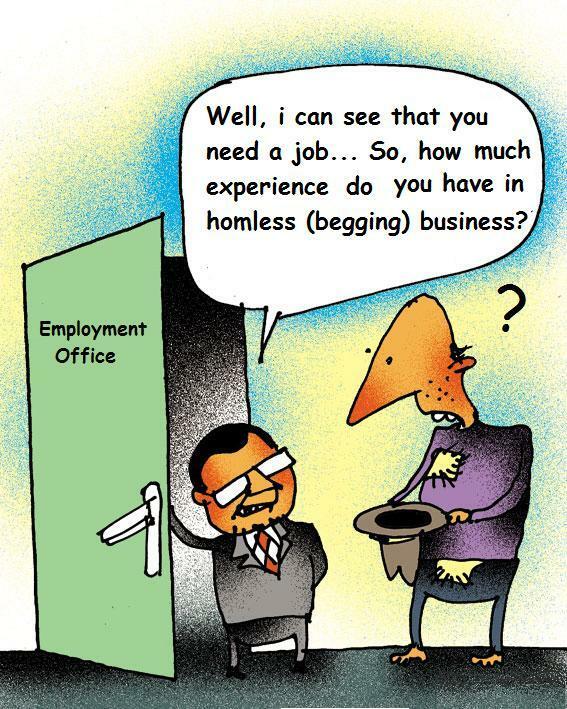 Here the job seeker finds the prospective employer. Then, is the interview stage, that helps the employer to figure out if the CV is Based on real information and facts, or just the person in front and the one from the paper are two different persons. So far so good! Now, on the third stage, the training or probation period, each company is applying the “Indoor rules” and the employment process is getting different one from the other. So, there are companies, that treats the candidates not to good and at the end of the process, those who didn’t get the job, are, on the other side, relived… Of course, I understand that you can’t take care of all candidates, especially when we talk about a big number. But I think, actually I am convinced, that the employer needs to treat the candidates even better than the clients. Just think about it for a second. When you want to fix your car, your are searching for an Auto Service that it’s good and trustworthy. And if you have two options to chose: the first one – a former client told you that they didn’t fix the steering wheel to well, so he advise you not to go; or the second Auto Service: an ex prospective-employee, that tells you that the service is not too good, he worked there for a while, and he knows it! In this case I am sure that you’ll chose the first Auto Service, that couldn’t fix only the steering wheel, not the one that has the entire service broken. You’ll not chose this one, because a former employee knows better what really happens there! So that’s why I think that it’s really important to treat the applicants very well, cause they can influence very well the clients. Too bad that the company that hired me for a probation period doesn’t know that. What can I say, at the beginning was ok, the key to my employment in that company was to find more clients to buy their services. It was clear from the beginning, that I am not going to be paid for this time and if I won’t bring enough clients, I’ll have to find another job. It was ok, I was agree. The time that I was in the office, the people from there were treating me nice, but still, it was different… not that friendly as they appeared to be with the clients or between them. Well, I thought that it was like this because I’m new. They told me to provide them with a database with clients from my phonebook that corresponding to the clients profile. That’s odd… I don’t have friends that can be their clients. So I guess that from the start I was doomed. But I didn’t give up, I started to search new clients. Then I realized that I don’t have a place to work. It was a small desk in the corner, to fit a notebook – so no chance to invite the clients, that I hardly found, to my desk. It’s ok with that, too. Maybe after they will decide to hire me, they will find me a desk. Time was running, but I didn’t get the chance to have enough clients, I had only a couple of them. So I was expecting to not be approved. But guess what, I didn’t expect to “ get fired” over the phone…. It’s like getting dumped over the phone or even worse in a small note left on the table. Honestly, I did not expect this from a big company in their field. I think it would have been nice to let me know about their decision in the office like they really care. Now I think that is better to hire someone only for a probation period, to not pay a penny for it, and to get you new clients. It’s pretty convenient, right? Sure, I can make them a bad publicity, (don’ get me wrong, I am not doing this now) and they can lose the confidence of a few clients…. But then again, it’s pretty obvious that this is not the main concern of the employer.